A miscellany of musings on books, music, the history of ideas, the environment, and hiking. A review of Payback: Debt and the Shadow Side of Wealth by Margaret Atwood. Toronto: Anansi. 2008. Given the current worldwide economic malaise, it appears rather prescient that the 2008 Massey Lectures address the subject of debt. In these lectures, Margaret Atwood examines of the concept of debt as a motif in human society, particularly through an examination of metaphors of debt in western literature. As such, this book only obliquely deals with personal monetary debts. Rather, the focus is on the more general idea of debt in relation to justice, sin, redemption, balance, and revenge, among other topics. 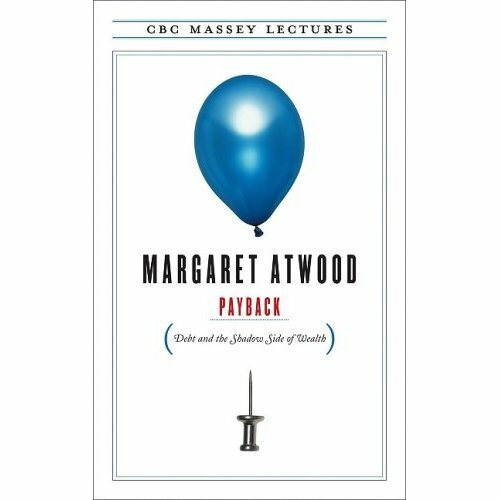 Atwood begins with the idea of debt and its relationship to fairness, which is ingrained in the psyche of the human race (and other intelligent creatures). In early societies, notions of debt are aligned with justice, which is typically represented by a supernatural female figure. It is the emergence of Greece, and the induction of the court system described in Aeschylus’ Oresteia, that the idea of a female arbiter of fairness/justice (and thus of debt) is replaced, although the feminine image remains. Next, Atwood describes the links between debt and sin. In heaven, debts are forgiven; in hell, debts are eternally paid back. The character of Satan is often portrayed as a collector of debts, and often described as wielding a ledger. With these notions of debt and sin, the creditor is often seen to be as sinful as the debtor, particularly in pre-industrial literature. Moreover, motifs of debt are always twinned with motifs of credit, one symbiotic with the other. Was Dickens consciously writing Scrooge as a reverse Faustus? … There are so many correspondences it is hard to avoid the thought: Faustus longs to fly through the air and visit distant times and places, Scrooge dreads it, both do it. Both have clerks – Wagner and Bob Cratchit – the one treated well by Faustus, the other treated badly by Scrooge. Marley is Scrooge’s Mephistopheles figure who carries his own Hell around with him… Everything Faustus does, Scrooge does backwards. As someone who has been studying variations of the Faust legend for over a decade, I found this digression fascinating. The characters of Scrooge and Faust will loom large over the subsequent lectures in this book. An examination of the shadow side of debt described in the title focuses on the ideas of punishment, resentment, and revenge, among others. The endless cycles of revenge and counter-revenge exemplified in the myth of the house of Atreus are shown as analogous to cycles of debt and credit: one is a moral debt, the other a financial one. The solutions to both are laws (as exemplified in the Oresteia) or forgiveness (as exemplified by South Africa’s Truth and Reconciliation Commission). The shadow side of the debtor is the creditor: hence we have Faust/Mephistopheles, Scrooge/Cratchit, and Antonio/Shylock. It was inevitable that a treatment of the motif of debt would include mention of The Merchant of Venice, and Atwood succeeds with a detailed and trenchant analysis of the relationship between Antonio and Shylock with regards to the debtor/creditor roles. I don’t really own anything… Not even my body. Everything I have is only borrowed. I’m not really rich at all, I’m heavily in debt. How do I even begin to pay back what I owe? Where should I start? Scrooge Nouveaux’s thoughts apply to all of us. Where shall we begin? I read another review of this and wasn’t sure how I would feel about the rest of it – I now see the review didn’t even scratch the surface of Atwood’s project. It didn’t even mention the different works she looked at. The Scrooge/Faustus connection is one I will also be particularly interested in. So I’ve added this to my list – thanks for the review. You’re welcome – I’m glad you liked the review. Atwood casts quite a wide net here, and I left out many of her arguments in my summary. The conclusion rang a bit hollow for some reviewers, but I enjoyed it. As always, her writing is insightful and inspiring. She is, in my opinion, one of the few modern writers who is equally adept in prose, poetry, and criticism. I was really intrigued by her Scrooge/Faustus connection, and hope to be looking some more into this soon.